IIM Calcutta Innovation Park (IIMCIP), a Section 8 company formed under the aegis of IIM-Calcutta to promote entrepreneurship and innovation in research and business through industry-academia partnership, is currently focusing on nurturing innovative startups from the eastern region. Targeting at least 5,000 start-ups across India, IIM Calcutta Innovation Park (IIMCIP), a section 8 company formed under the aegis of IIM Calcutta, will launch a talent hunt in the form of an event for a couple of months. “Our objective is multi-pronged. We will identify, mentor and promote about 100 startups by 2020, and ensure that each of them get funding. To make that a success, we need to increase our visibility as well, which is why we are organising the challenge,” said Professor Ashok Banerjee, IIM Calcutta faculty, during a press conference on Wednesday. IIM Calcutta Innovation Park (IIMCIP) is working towards supporting 100 plus start-ups by 2020. The mission has taken off with IIMCIP backing up six start-ups in the last one year across sectors like healthcare, education, technology and others by pumping in total capital to the tune of Rs1 crore. MyPrivateTutor, Bodhi Health Education, Edwell Solutions, Appeti, Organic thali, and Magasool being some of the startups IIMCIP has helped with the seed capital. The second Thinking Social roundtable for the year 2016-17 was organised under the aegis of Tata Social Enterprise Challenge (TSEC), by IIM Calcutta Innovation Park (IIMCIP) in association with the Tata group in Delhi. The theme of the roundtable was Sustainable Community through Women Empowerment. 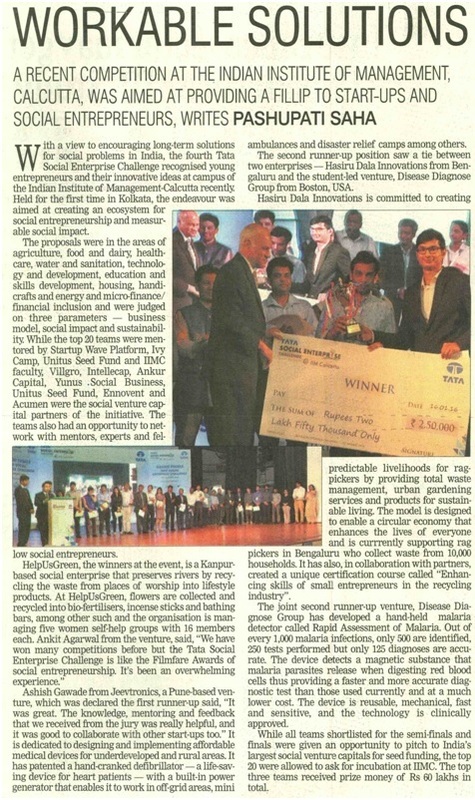 he Tata group has launched the Tata Social Enterprise Challenge 2016-17 in collaboration with the Indian Institute of Management Calcutta (IIM-C), to find India’s most promising early-stage social enterprises. This national competition aims at creating an ecosystem for social entrepreneurship and encourage sustainable, scalable and measurable social impact. Around 250 government officials are set for their IIM-Calcutta experience in July-end as part of the partnership forged by the state micro and small scale enterprises (MSME) and textiles department with the premier B-school at Joka. Amid growing concerns over the absence of big-ticket investments and closure of iconic units, chief minister Mamata Banerjee, who is the minister in charge of the MSME and textiles department, has been harping on small industries. It’s believed that the IIM-C training will help state achieve a target to identify around 5,000 new entrepreneurs. Gopal Paul introduces himself as the CFO or the chief fun officer of Izifiso, and his “partnersin-crime“ are apparently “crazy people like me“. Petted and pampered by IIM-Calcutta, his is one of the two innovations adopted by the premier management school on its Joka campus. At Indian Institute of Management Kozhikode, every student mandatorily takes up a social project as part of the core curriculum. The objective is to make the students understand the society at large and sensitise them to the challenges faced by various sections of the society. 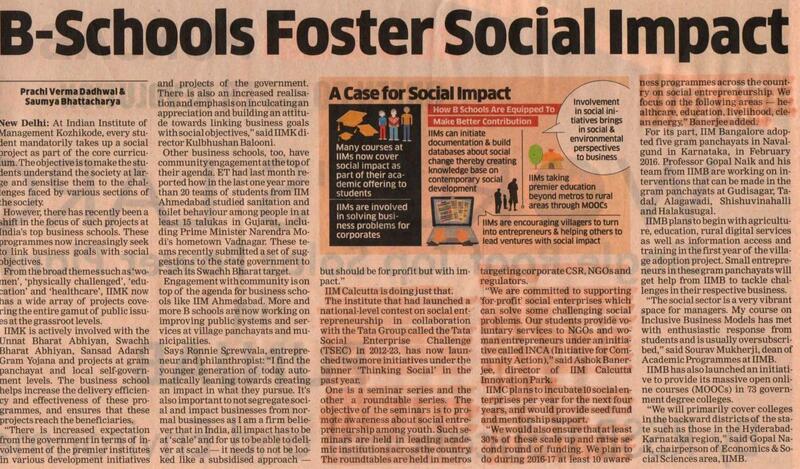 However, there has recently been a shift in the focus of such projects at India’s top business schools. These programmes now increasingly seek to link business goals with social objectives. He doesn’t quite fathom why would someone need an app like Snapchat to take selfie that disappears within seconds or sites that sell luxuries for pets. For serial entrepreneur K Ganesh, future of start-ups in India lies in solving basic necessities of life. He should know. From starting Customer Asset that later become Firstsource, one of country’s leading ITeS ventures, to pioneering TutorVista where Indian teachers gave online tutions to overseas students, Ganesh has never failed in his ventures. Much sought after in tech-circle for his gyan, this IIM-Calcutta graduate is now spending time solving some of the daily problems of life through start-ups like BigBasket, a leading online grocer to Portea that provides medical care at home, and many others. Sumit Moitra caught up with Ganesh at his alma mater, where he had come down for a day to guide start-ups at IIM Calcutta Innovation Park. 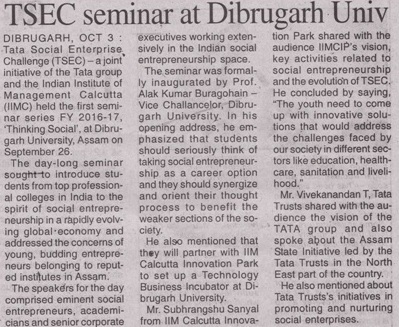 The third “Thinking Social” roundtable was organized under the aegis of Tata Social Enterprise Challenge (TSEC) 2015-16, by IIM Calcutta Innovation Park (IIMCIP) in association with the Tata group. The theme of the Roundtable was on “Healthcare” and this event was supported by Coaching Foundation India Limited (CFI). This thematic Roundtable included two interactive panel discussions – one focusing on Quality, Access and Affordability and the other focusing on Leadership in the Healthcare domain. Converting containers into mobile sanitation, education and healthcare facilities; triggering a White Revolution by supplying cattle feed at half the marketprice; fashion accessories for women that have built-in safety, wellness, lifestyle and communication systems; augmentative and alternative communication device for those suffering from cerebral palsy and paralysis; dry toilet for Ladakh; portal to resolve legal disputes online… these are some of several bright ideas that have made it to the Grand Finale of the Tata Social Enterprise Challenge (TSEC) scheduled at Indian Institute of Management-Calcutta (IIM-C) on Saturday. At a time when various e-commerce start-ups are lapping up multi-figure funding at high valuations, social start-ups are staring at a drought. A recent competition at the Indian Institute of Management Calcutta was aimed at providing a fillip to startups and social entrepreneurs.